The Environmental Protection Agency and many state environmental departments have rules regulating universal waste. These regulations were set forth to promote the collection and recycling of universal waste. What is classified as universal waste? These include, but are not limited to: fluorescent, high intensity discharge, neon, mercury vapor, high pressure sodium, and metal halide lamps. These include, but are not limited to: nickel cadmium, nickel metal hydride, silver oxide, mercury oxide, lithium ion, and lead acid batteries. This includes, but is not limited to: thermometers, barometers, thermostats, switches, manometers, flowmeters, mercury light switches, mercury regulators, pressure relief gauges, water treatment gauges, and gas safety relays. These are typically older televisions and computer monitors. They have been vastly replaced by flat panel displays. CRT glass contains lead. Contain many recoverable materials such as aluminum, copper, gold, silver, plastics, and ferrous metals. 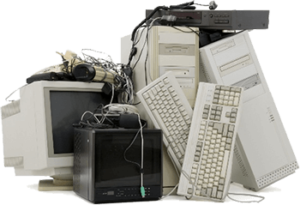 In order to conserve natural resources and the energy needed to produce new electronic equipment from virgin resources, electronic equipment can be refurbished, reused, and recycled instead of being landfilled. Any that have been manufactured before 1978 or are not stamped “NO PCBs” should be considered PCB fluorescent light ballasts (PCB ballasts) because the small capacitor included as one component of the ballast probably contains polychlorinated biphenyls (PCB). At MLi Environmental (MLi) we have actively marketed our ability to pick up all types of universal waste and electronics for recycling. Our knowledge of outlets and segregation of waste streams, sometimes allows us to pack and transport your electronics at little, or no, charge to you. Over the years, this has become more of a ‘value-added’ service, as we are primarily packing waste chemicals, and end up taking extraneous universal waste from our clients. They in turn minimize the usage of multiple vendors, and this saves money in their budget. Let us help you manage your universal waste inventory for recycling in an environmentally responsible manner! We have recycled over $100,000 worth of electronics from Texas to Maine. Well versed in state and federal regulations, you can rest assured your universal waste is certifiably recycled. MLi is able to estimate any cost related to this effort through a simple visit or a picture of inventory sent by you to us for review. We look forward to working with you!